Approval of President Bush is up in two new polls, compared to those poll's previous readings, but the trend across all polls is essentially flat. That contrasts to data earlier in the week that suggested approval had started to decline. In short-- it remains a puzzle. The NBC/Wall Street Journal poll taken 7/21-24/06 found approval at 39%, disapproval at 56%. That is a 2 percentage point increase from the NBC/WSJ poll of 6/9-12. The CBS/New York Times poll of 7/21-25/06 registered approval at 36% and disapproval at 55%. That was a 3 percentage point increase from their 6/10-11 poll. So both these readings are modest rises from previous polls by the same organizations. So approval is up, right? Well... maybe not. Between the two June readings and now, however, were three polls that suggested approval had reached 40%, and for one brief moment my trend estimate reached 40.009% on July 11, which promptly fell below 40 with the next poll on the 13th. With all subsequent polling the trend estimate has been revised down to it's current level of 37.6%. The revisions imply that the high for the trend was never actually much above 37%. Close inspection of the figure below shows that when several polls came in at or above 40%, these were balanced by a number of other readings in the 35-38% range. 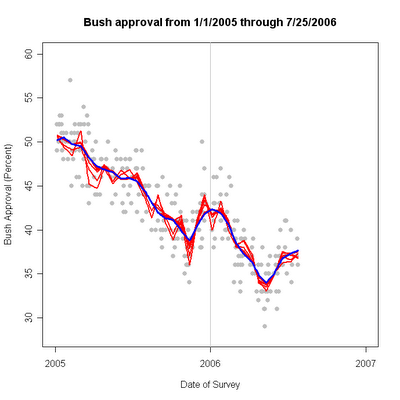 With all those data taken into account, the blue trend line estimates that approval was actually around 37% with scatter above and below that. Since early July, the standard blue trend line has remained on a very slight upward path, but a better reading would be "flat" for the last 3 weeks. But what about the less conservative "red line" estimate, that was telling us two days ago that approval had started to decline? With the addition of these two new polls, "hasty red" isn't so sure anymore. There is still a slight downturn in the red trend, but it is considerably less than it was on Tuesday. Then the red-line estimate of approval was 36.2% but with these two new polls "red" thinks 36.7% is more like it. That's still a bit lower than "old blue" at 37.6%, but the shift shows that the more sensitive estimate is being buffetted about by the polling, rather than detecting a clear trend that the conservative blue line estimate can't yet see. A fair characterization of their stories would be that both see approval within +/- 1 point of 37% and have had it there since about June 11. There may be as much as a 1 point trend in that period, but it is clearly a flatter period than in the month from mid-May to mid-June. I've fussed over the differences between the sensitive red-line estimator and the conservative blue-line quite a bit. In this case, the recent history isn't that affected by how sensitive an estimate I use. The figure below shows a number of red-line estimates that vary from extremely sensitive to almost as conservative as the blue line. What this shows is that the sensitivity doesn't really tell a very different story here. 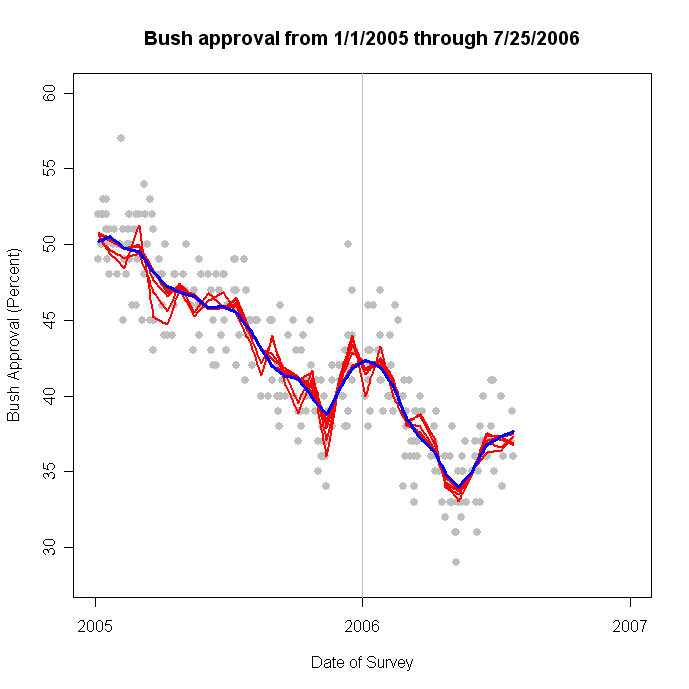 Compare that to the variation at some earlier points, especially in the bottom of approval in late 2005 and the peak of approval just before January 2006. There the red lines differ a good bit from the blue line when we make them most sensitive. By contrast, the variation in May and now is rather small. 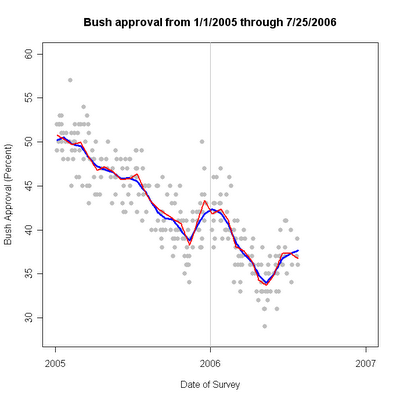 So in this light, the peak of approval was probably significantly over-estimated when some polls passed 40%. Even the most sensitive estimate doesn't produce a trend now that would reach that level. The improvement in approval between mid-May and mid-June now looks to have been about 3-4 percentage points, a significant improvement, and an important reversal of the previous trend. But this now looks like it was comparable to the November-December 2005 rally. Earlier it looked to have considerably surpassed that earlier run. With all the data now in hand, it looks at most like the polls over 40 were very brief spikes in approval, or more likely they were simply random draws from the high end of the error distribution. All of which leaves open the question of what will happen next? Is this really a plateau of approval, or is it the beginning of a decline? Or might events produce another rise? Wait and see. FLASH: Hotline just came in with approval at 38%. That more or less splits the difference between CBS and NBC so won't change the estimates above by very much. 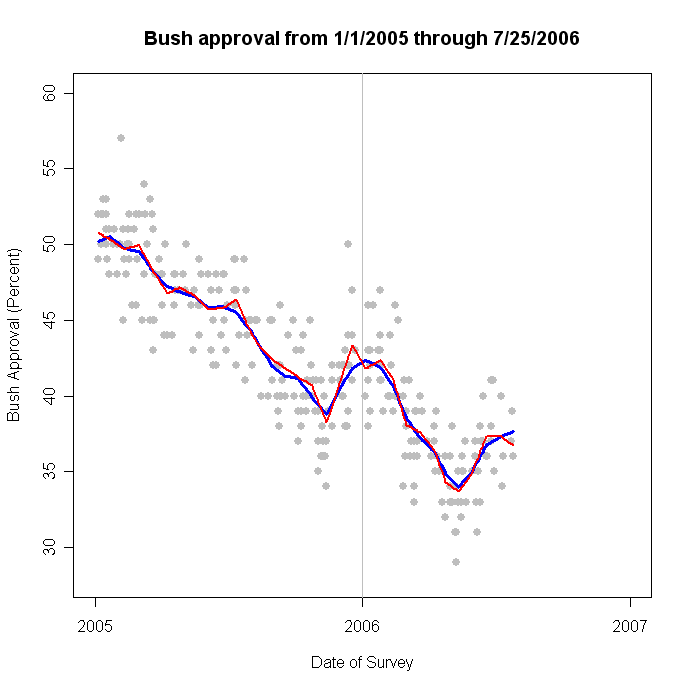 But it does add to the sense that approval has flattened out. I'll post on this late this afternoon, after a meeting.